ItemKojonup 381 - Locations 4017-4036, 4076-4084. Nelson locations 2011-2013 (Near Warkinup) by P.W.E. Flint, Fieldbook 24 [scale: 20 chains to an inch]. ItemKojonup 427 - Kojonup Brook by F.S. Brockman, Fieldbook 134, later addition by A.J. Wells [scale: 20 chains to an inch]. ItemKojonup 445 - Locations at Nampup (Nyabing Townsite) by W. Rowley, Fieldbooks 168 & 170. Location 6165, 1958 [scale: 20 chains to an inch]. 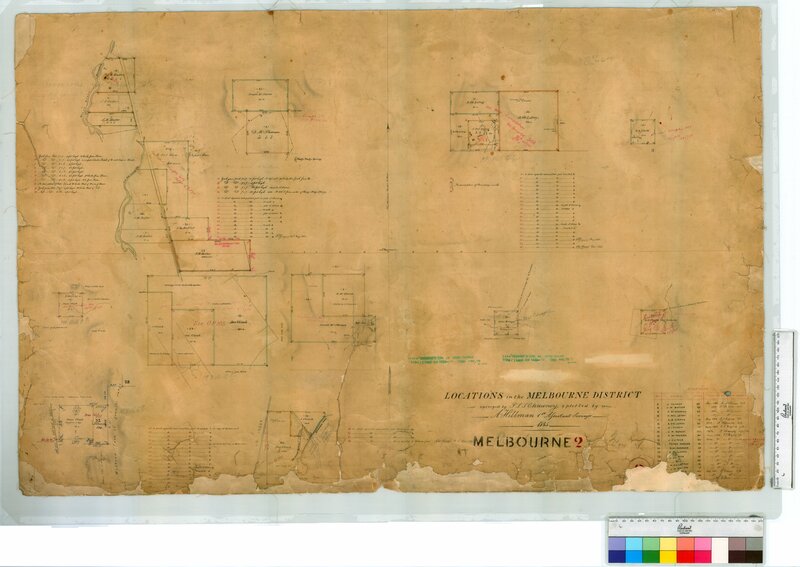 ItemKyarra 6 - Goldfields Water Supply Branch, Plan of Cue-Day Dawn Road Survey by A.E. Arney, Fieldbook 4 [scale: 20 chains to an inch]. ItemMelbourne 002 - Moore River area by P.L.S. Chauncy and A. Hillman, and later additions [scale: 8 chains to an inch]. ItemMelbourne 004 - Moore River, Koojan Pool, Yatheroo Brook. Locations 58, 45, 56, etc by C. Evans, later addition (Lot 58) by R. Quin. ItemMelbourne 005 - Locations 2, 4, 5, 18, 27, 28, 30 by A. Gregory, Fieldbook 19, and F. Gregory, 1858, later addition by C.W. Leeming, Fieldbook 2 [scale: 4 chains to an inch]. ItemMelbourne 006 - Vicinity of Quarrell Range by A. Forrest, and later additions, 1886 [scale: 20 chains to an inch]. ItemMelbourne 013 - Locations 104, 105, 206, 231 & 247 by A. Forrest 1872. Victoria Locations 797, 798 and Reserve by Forrest 1873, later additions 1886 [scale: 20 chains to an inch]. Item Melbourne 002 - Moore River area by P.L.S. Chauncy and A. Hillman, and later additions [scale: 8 chains to an inch]. Moore River area by P.L.S. Chauncy and A. Hillman, and later additions [scale: 8 chains to an inch]. Confirm Item Request: Moore River area by P.L.S. Chauncy and A. Hillman, and later additions [scale: 8 chains to an inch].